The 187 series of folders, named for the 3/16ths inch stock used throughout, is MKTs lower price-point offering for those absolute knife Pigs who want more than 1 MKT folder. If you are saving for the penultimate custom MKT blade or holding out for the Praetorian Ti, then we have something to tide you over. For the rest of us (who want to remain married) this series gets a man a hand-made American knife with rugged uniqueness that is truly American…every blade is absolutely unique. To maintain this amazing price-point we offer the 4 folders in this line as pictured only. There are no customizable options. 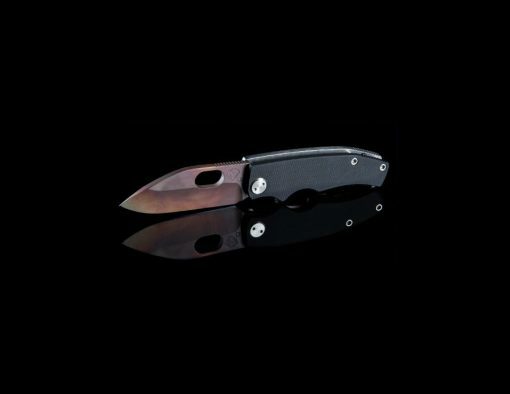 The 187RMP is the smallest folder MKT offers. The Ramp Nose style blade is absolutely functional and looks mean. The dual sub-hilt composition of the handle and blade offer superb grip comfort for all uses. This model offers a man a compact knife with as much blade as is possible crammed into the tidy package. When carrying a real knife is a must, but size, weight and space are a concern, the 187 RMP has no equal.